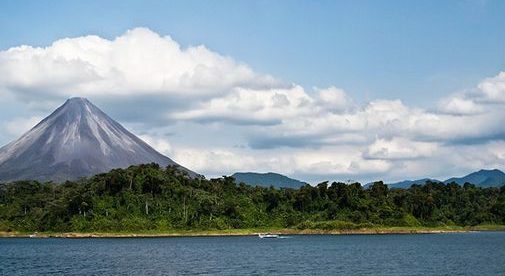 The towering Arenal Volcano makes a great backdrop to the lake. The road from Nuevo Arenal to La Fortuna is one of the best two-lane roads in Costa Rica. Our house is located down this road. It’s only eight minutes from the center of town, up a steep, paved driveway, and it brings you to a vista that will take your breath away the first time you see it. From it, my wife, Christine, and I have a view of Lake Arenal, from the whirling wind turbines of Tronadora to the north, all the way south to the majestic Arenal Volcano. The lot is well worth the $60,000 we paid for it in December 2016. As a 71-year-old, retired from careers in education and real estate, I have always worked within a strict budget. It’s no different here. We have no expenses for heat or air conditioning, because the temperature is always between 65 F and 85 F. The electricity we use runs about $50 a month. I pay $75 a month for internet and another $50 a month for TV and cable. Our cellphones cost us $140 a month, because we do make quite a few international calls. The house is paid for, and so is the one car we share. My car insurance, for very good coverage, costs me about $75 a month. All told, I estimate that we spend another $1,200 a month for all our food, restaurants, propane for cooking, and gasoline. In my research for living in Central America, I read that we could live here on $3,000 a month and live well. That’s true, although in our case we choose to spend a little more. Christine and I are vegan, and although this adds a little to our food budget, she has been able to adapt our dietary needs quite well and we now eat more healthily than ever. We have a custom 2,000-square-foot, one-story house that accents the top of the hill where we are located, and that also provides us with our unobstructed view. There are three bedrooms, two bathrooms, and lots of space on the outside patio to enjoy the weather and the scenery. We also designed it to have ample parking, allowing us to host parties for family and friends, as well as for our Airbnb travelers. It cost us about $200,000 to complete. In budgeting for the move, I added a line, to come out of my savings account, to pay for repairs and additions to the property. However, in all respects, we are financially sound on a combination of Social Security and my pension, and we are even saving money. This is not something we did well when we had an income of over $175,000, two cars, two jobs, and much less time for ourselves, working and living in upstate New York. My budget still includes about $200 a month for Medicare, which I will maintain until I gain legal residence in Costa Rica and the country’s health insurance kicks in, probably sometime early this year. I also have a $200 life insurance payment. When we have the Caja (Costa Rican health insurance), it will add about another $178 a month to my expenses. That’s a lot different from the $500 a month my wife had to pay for her health insurance in the States. By the time we get residence, there’ll be no need for the Medicare payments, as we will both be fully covered by the Caja. The Costa Rican lifestyle is slower and less stressful than our lives in the U.S. My morning starts at 5 a.m. with a cup of locally grown coffee, and I watch the sun rise over the lake and listen to the birds and monkeys. While my wife is at yoga, I practice tai chi. We take Spanish classes twice a week, spend a lot of time with our new expat friends from around the world, and are usually in bed by 7 p.m., when the sun goes down.